In May of 2007, and again in May of 2008, Guenter L. and Dan C. set up a table at the Craft Fair at the Highland Adult Activities Center where they hoped to identify people who would like to form a coin collecting interest group (as well as stamp collecting, travelogue, and genealogy interest groups) at the Center. Because there wasn’t much interest in a coin collecting interest group at the Center, they decided to form a coin club that would draw members from numerous communities in the Huron Valley. On November 9, 2009, with a membership of 22, the club elected its first officers and board members: Chair – Jim M., Program Chair – Chuck S., Secretary/Treasurer – Darlene S., and Board Members – Mike B., Dave E., Ken G., and Guenter L..
Fred B., Mike B., Elmer B., Randy C., Dan C., Chris C., Dave E., Ken G., Max G., Milo G., Chris H., Karl K., Gary K., Guenter L., John M., Jim M., Chris O., Al R., Glen R., Larry R., Chuck S., Darlene S..
April 2010: HVNS has an auction at a meeting (with Chuck S. as auctioneer). February 2012: HVNS co-hosts the Polish American Numismatic Society (PANS) coin show (coordinated by Jim M.). 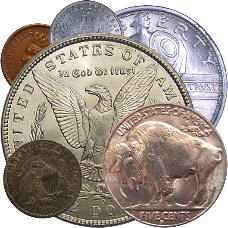 April 2013: HVNS joins the American Numismatic Association (ANA). March 13, 2013: HVNS welcomes a young Numismatist, Cy J., as a speaker. May 2016: HVNS puts a Milford Tokens and Medals exhibit in the Milford Historical Society Museum.